Living the expat life as I do, there are inevitably times when I begin to doubt my Americanness. Usually this happens when I find the latest U.S. celebrity gossip or pop culture reference sailing over my head, and definitely when I confess to fellow Americans that I actually don’t like peanut butter all that much. This identity crisis doesn’t particularly distress me, I have to admit, and I even find myself concocting fantasies about how my character has evolved into some kind of sophisticated pan-national cocktail of all the places I’ve lived. These nation-free delusions have even enjoyed occasional reinforcement from others, such as the time I was buying a bus ticket in New Zealand and the girl behind the counter confessed at the end of our transaction that she had been trying to place my accent but couldn’t get beyond ‘somewhere European’, or the time my own mother told me my speech had become so regionally ambiguous she would assume I was a non-native speaker of English if she didn’t know me. Aww, thanks mom. But then something happens, every year without fail, to shatter my cosmopolitan fantasies and bring me crashing back down on my roots. It starts shortly before a certain Thursday in November and lasts about a month, give or take a few days, and sees me afflicted by the totally uncontrollable and overwhelming compulsion to bake pies. You see, despite the plethora of foodstuffs traditionally associated with the holiday period, the only one that seems to have stuck itself like velcro to my psyche is the one involving pies. Threaten a Thanksgiving without turkey and I won’t bat an eyelash. Threaten to take away my pies, and watch out. The funny thing is that I don’t love pies per se – I mean I certainly don’t dislike them, but if at any other time I’m given the choice between pie and crisp, or pie and cheesecake, or pie and something fudgy and chocolate, the pie will probably lose out, but that fact always gets conveniently buried under all the flour, butter and perfectly-crimped edges passing under my fingertips at this time of year. The only explanation I can devise is that somewhere along the line pies came to represent the one most potent symbol of the family-filled holiday celebrations of my childhood, and making them now is the strongest link I can conjure to those increasingly distant memories. In all honesty, though, my favorite pie, and the one I have to make at least once every holiday season, is not the pumpkin, apple, pecan or (heaven forbid) mincemeat of my youth, but a comparatively recent arrival called, somewhat peculiarly, Toll House pie. Toll House is actually the name of a cookie – the original chocolate chip cookie, to be precise, the recipe for which has been gracing packages of Nestle semi-sweet morsels for decades. It was supposedly coined back in 1930, when Ruth Wakefield and her husband purchased an 18th-century toll house in Whitman, Massachusetts, and built an inn upon the site. In keeping with the toll house tradition of providing weary travelers with home-cooked meals, Ruth cooked and baked for guests who stayed at the new Toll House Inn. One day, while preparing a batch of Butter Drop Do cookies, a recipe dating back to colonial days, Ruth cut a bar of Nestle semi-sweet chocolate into tiny bits and added them to her dough, expecting them to melt, but instead found that they simply softened and provided little nuggets of chocolate in the buttery dough. The resulting recipe became wildly popular, was published in newspapers across the country, and was eventually sold to the Nestle corporation who have been printing it on the back of their chocolate packaging ever since. The Toll House name has subsequently been given to other sweet treats that contain those familiar morsels (such as the ones in here), but in my book none was more inspired – or more delicious – than the pie. It’s hard to imagine that a pie inspired by a cookie could be anything worthy of acclaim, let alone family tradition, but I assure you it is anything but a gimmick. Toll House pie manages to offer the best qualities of a chocolate chip cookie – all that buttery, caramelly chewyness bursting with chocolate and nuts – and puts them in pie form, which, like the perfect cookie, gets ever-so-slightly firm on top but stays wonderfully soft and gooey inside, the perfect textural foil for the crisp and flaky pastry crust. It is rich, certainly, but so good that it belongs to the small category of recipes I’ve barely tweaked at all to suit my own tastes. While I have made a couple of minor improvements, like substituting good bittersweet chocolate for the Nestle chips, and browning the butter with a vanilla bean to coax out just a little more flavor, the heart of this recipe remains just about as all-American as it gets. And that kind of appeals to the pie-baking patriot in me, since while I may not go out of my way to show my homeland that it still holds much sway over me, when it comes to the holidays, America will always have my stomach. Sources: The filling is a Nestle classic recipe; the pie crust, impossibly tender and flaky and currently my favorite, comes with minor adaptations from Rose Levy Beranbaum and her Pie and Pastry Bible. 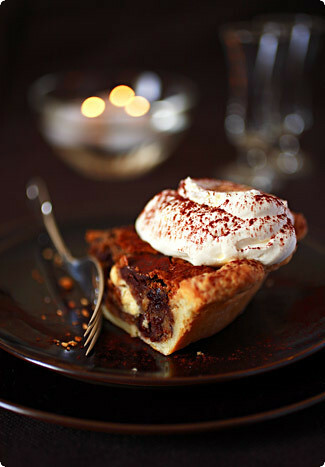 Notes: The great thing about this pie is that it really is like its namesake cookie in the sense that just about anything goes – while the basic recipe is really good, it’s also really good chock-full of just about every kind of chocolate, nut, or fruit that tickles your fancy. So feel free to make it as-is, or to use the recipe as a template – I’ve included some suggestions for other additions, but really, the sky’s the limit. The pie pictured above, for example, was made with 1/2 bittersweet and 1/2 white chocolate, pecans and dried tart cherries. Yum! To make the crust, cut the butter into small (about 3/4-inch) cubes. Wrap it in plastic wrap and freeze it until frozen solid, at least 30 minutes. Place the flour, salt, and baking powder in a plastic bag and freeze for at least 30 minutes. Place a metal mixing bowl in the freezer as well. Place the flour mixture in a food processor with the metal blade and process for a few seconds to combine. Cut the cream cheese into 3 or 4 pieces and add it to the flour. Process for about 20 seconds or until the mixture resembles coarse meal. Add the frozen butter cubes and pulse until none of the butter is larger than the size of a pea. Remove the cover and add the cream and vinegar. Pulse until most of the butter is reduced to the size of small peas. The mixture will be in particles and will not hold together. Dump it into your chilled mixing bowl and using your hands, begin pressing the mixture together, kneading lightly, until it all comes together and forms a compact, cohesive ball. Add another dribble of cream if you need it – this dough is better slightly too moist than too dry. Don’t handle the dough any more than necessary, though. Wrap the dough in plastic wrap, flatten it into a disc and refrigerate for at least 45 minutes (you can make the browned butter during this time – see below). Roll the dough out on a well-floured surface to a large circle at least 12 inches (30cm) in diameter. Using a 9-inch (23cm) pie pan as a guide, cut out a circle of dough about 1 1/2-inches larger than the pan on all sides. Gently ease the circle into the pan and flute or crimp the edges as desired. Let rest in the refrigerator while you make the filling. To make the filling, preheat the oven to 325F/160C. First brown the butter* (you can do this while the dough is chilling). Place the butter in a skillet over medium heat. Split the vanilla beans down the middle and scrape the seeds with the tip of a knife into the skillet. Toss in the vanilla pods too (if you’re using extract, add it to the egg mixture in the next step). Swirling occasionally, bring the butter to a boil and keep it boiling until the solids turn chestnut brown and everything smells deeply nutty. Do not let it burn. Remove from the heat and let cool. Discard the vanilla pods. In a medium bowl, beat the eggs with the sugars for a couple of minutes, until thick and light. Fold in the flour and salt, and then the cooled browned butter until everything is incorporated. Stir in the chocolate, nuts and any additional ingredients. Pour the filling into the chilled crust, set on a baking sheet to catch any drips, and bake in the preheated oven for 60 minutes. Remove and let cool for at least 30 minutes before serving. Serve with whipped cream or vanilla ice cream, warm or at room temperature. Actually, it’s pretty good cold too. I’ve even been known to eat it frozen. *If you’re pressed for time you can forego the browning of the butter, in which case just melt and cool it slightly before adding to the other filling ingredients. Oh yes, that pastry recipe, I know it well. It’s amazing. Amazing! Happy Thanksgiving, Melissa! Yeah, I’d take a slice of this over apple, pumpkin or mincemeat anyday. I’m gonna do an apricot crostata for my contribution this year. Happy Thanksgiving, this looks and sounds great! Happy Thanksgiving. This recipie sounds like paradise. My goodness. I’m in the process of scouting some holiday recipes. I’m. So. Making. This. My family sends their thanks in advance. This looks absolutely delicious…..I would enjoy a bite right now! Thanksgiving is the only holiday where I steadfastly repeat the most traditional food each and every year…I think I’d probably be divested of pie duty otherwise. (One year I broke out and made a trifle-but..) My pumpkin pie is done, and I’ll be making the apple tomorrow. After that, well, this looks like a good candidate for Next New Pie. A Happy Thanksgiving to you. Heaven forbid we take your pies away from you, Melissa! I say bake away. I will happily support you in your pie-baking endeavours.Happy Thanksgiving! It does look super. Where’s mine? Thank you, everyone! I hope you all had a wonderful Thanksgiving (or, for the rest of you, a pleasant last Thursday in November ;).Luisa – It is amazing, isn’t it? I only wish I had discovered it years ago. When I was handling the dough it was so moist and stretchy I thought it was doomed to fail, but it baked up tender and crisp as any crust I’ve ever made!Sam – It’s a strange thing. I never really cared much for Thanksgiving until I left the US and had to endure years without it. Although I still feel it’s too close to Christmas to justify all that indulgence, I appreciate the fact that it’s really the only American holiday that’s centered around nothing more than food and family. Austin – I feel your pain. I don’t know how you survive, but then again I’m sure life in Thailand has *many* other perks, which I’m guessing more than make up for the lack of ovens… :)Lindy – In my family as well the food traditionalists come out of the woodwork at Thanksgiving. Although I’d be happy to eat anything so long as there’s pie afterwards, I would risk life and limb if I suggested doing away with certain other annual staples. Although in all fairness to them, they’re vegetarian so it’s Tofurkey instead of Turkey, which no doubt would make other Thanksgiving purists scream! Thank you for this recipe. I made it last year, didn’t brown the butter and still had so many compliments about the pie. This year I browned the butter and holy cow! What a pie! Sherpa – so glad to hear it! Happy Thanksgiving! Did you use a bar of chocolate and just chop it up roughly?It looks so good! Melissa,I would love to make this with pistachios, but I’m not sure what other ingredients would be good with them. Any ideas? Hi Hilary – Hmm, what doesn’t go with pistachios? I love the combination of dark chocolate and pistachios, but if you want fruit both sour cherries and apricots would go great with them. I’m sure whatever you do will be delicious!